I have always enjoyed travel and have always enjoyed outdoor activities. I have traveled in the US, have traveled to and lived in Israel, and I have been to Poland, South Africa, Puerto Rico, Ukraine and Germany. Traveling as a Jewish person who abides by the laws of kosher food can be difficult at times, but if you plan correctly it can easily be done. 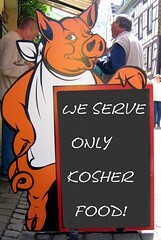 First, a primer on observing the laws of kosher (keeping kosher) is in order. Keeping kosher means that you observe certain biblical and rabbinic laws regarding the foods you can eat and how that food is prepared. Basically any food not in its natural form needs to follow the guidelines of being kosher. This basically means anything besides fresh fruits and vegetables. The Bible lists the basic categories of food items which are not kosher. These include certain animals, birds/fowl and fish (such as pork and rabbit, eagle and owl, catfish and sturgeon), and any shellfish, insect or reptile. In addition, kosher species of meat and fowl must be slaughtered in a specific way, and meat and dairy products may not be manufactured or eaten together. Something being certified kosher doesn’t mean that a rabbi has blessed the food. It means that a rabbi has investigated and certified that the item follows all the laws of keeping kosher. Many products sold in regular supermarkets are already certified kosher and can be easily identified by symbol on the package used by rabbinic organizations to indicate they certify the item, such as the symbol and the symbol. Some items, such as meat and cheese, are often only found in stores that cater to the kosher community. Being a kosher-observing traveler presents special challenges in addition to the regular planning for a trip. A regular traveler doesn’t usually worry about what they will eat for breakfast, lunch, dinner and snacks. They assume they will find a restaurant, a bakery, a supermarket etc or find some local who is hospitable and invites them into their home. When you keep kosher you have to think about every meal and snack you are going to eat when you travel. Travel in the US is usually pretty easy. In many cities across the US, there are restaurants that are certified kosher, especially in places like NY, Boston, Miami, Chicago and LA. The same holds true for many cities across Western Europe. Some people will only plan trips to places that have kosher restaurants and an abundance of kosher food readily available. It’s also good to keep in mind that a lot of hotels will provide kosher meals for hotel guests if they are given enough notice. Sometimes its just an airline kosher meal and not anything to write home about, but I’ve been pleasantly surprised by hotels going out of their way to contact a local (or sometimes not so local) kosher caterer to order fresh meals. Also, if traveling for business there are a few things to keep in mind. If you are traveling to a convention or conference that provides meals to attendees you can usually get a kosher meal by requesting one in advance. More and more I am seeing convention/conference registration forms that give you the option to request special meals and often kosher is one of the options. If you find yourself in a non-kosher restaurant for a business lunch, the more upscale restaurants can provide you with a kosher meal, again if you provide them with enough notice. I was once in Philadelphia attending a lunch at the Four Seasons and I requested only a plate of fresh fruit. The waiter came back a few minutes later and said the head chef would like to know if I placed that order because I keep kosher and I told him yes. He said the chef wanted me to know that if I am ever back there to notify them in advance and they will be happy to provide me with a kosher meal. But that doesn’t mean its impossible to travel outside the comfort zone of places with large Jewish populations and lots of kosher food. You just have to plan. You have to do research and know what, if any, kinds of kosher food are available in your destination, which will vary, and pack all of the food you will need with you. You can always buy fresh fruits and vegetables, bottled water and just about everywhere, Coca Cola. It can be very helpful to stay in hotels that have kitchenettes so you can prepare the food you bring with you. One of the biggest expenses of traveling can be eating out in restaurants every meal. If you are trying to eat healthy, eating out in restaurants can also be a challenge. So keeping kosher can help on both of those issues. Keeping kosher doesn’t mean you can’t meet locals and accept invitations to their home. You just find them a little bit differently. I can’t remember a trip I’ve gone on that when I go to a local synagogue (if there is one) for daily or Sabbath prayer services that I haven’t gotten invited for a meal. Locals are also an invaluable resource in discovering local kosher resources. Traveling by plane poses its own challenges. When you take short flights, most of the time the snacks given out are kosher. On longer flights that serve meals, you have to request a special kosher meal at least 48 hours in advance. But, whenever I travel, even if I have ordered a kosher meal, I always bring food with me because things can go wrong. On a recent trip to Munich, Germany I missed my connecting flight from Paris to Boston and had to be rerouted via JFK in New York City. My kosher meal flew to Boston, but I was flying to NY and didn’t have a kosher meal. I didn’t go hungry on the flight because I had some food and snacks with me. Certain items lend themselves to travel more than others. A staple for many kosher travelers are foil packets of tuna fish. Peanut butter, either in jars or the single serve travel sizes, is also a staple for many kosher travelers. Whenever I travel I make sure to bring along many snacks, including granola bars, nuts, dried fruit and rice cakes. The rice cakes are easy to use for an impromptu peanut butter sandwich. For a long time I have always traveled with instant oatmeal. Its light and takes up little room in my suitcase, I can get hot water just about anywhere and its a perfect breakfast (or lunch or dinner). My wife and I traveled to Puerto Rico in 2006. Because Puerto Rico is part of the US, the supermarkets carry many US brands that are kosher, especially the Pueblo market in Carolina which has many tourists. We knew this and planned around that. We stayed in a hotel that had kitchenettes in every room, and brought some food with us, like cooked chicken and meat, packaged deli meats and cheese and lots of snacks. Once we arrived we purchased items like cereal and milk, bread, rice, eggs and snacks. Of course, we also searched out the local Ben & Jerry’s ice cream store. So travel to PR was relatively easy. I’ve traveled to Kiev, Ukraine three times in the last year on business and it was also relatively easy. In Kiev there is one kosher restaurant and I rented an apartment close to it, near Maidan Nezalezhnosti (Independence Square). The office I was working in was about 30 minutes by subway from the apartment and the restaurant so it didn’t make sense to eat lunch there, but I ate dinner there almost every night. I brought food and snacks with me to cover breakfast and lunch, but knowing I had at least one good, hot kosher meal a day was very reassuring and was one less meal I had to worry about. It also meant that if my luggage didn’t arrive and the food in my carry-on luggage ran out, I wouldn’t be totally without food. Also, by becoming friendly with some people in the Great Synagogue of Kiev, I found out that a local Jewish school had a bakery for the students’ lunches but always would be willing to sell leftovers. Keeping kosher doesn’t mean you can’t travel where ever you want. It can always be done as long as you plan and are willing to think outside the box a little. There are some great websites for helping to plan a kosher vacation as well as some tour operators that offer kosher-only tours that will take care of everything having to do with food. Yeah, that’s kosher… : Its a blog with user contributed articles about different cities. It doesn’t just focus on food, but how to enjoy a destination while also keeping kosher. I’ve written posts about Boston and San Juan, PR. Shamash Kosher Restaurant Database : It’s a searchable database of kosher restaurants worldwide kept up-to-date by user submissions. If you have any questions about this article, please comment and I will answer all questions that I can. I live in Boston with my family and work as a software product manager. Except for college and a few years after, I have lived in Boston my whole life. I love being on my bike and being the near the ocean. My favorite area of Boston is the waterfront and the Boston Harbor Islands National Recreation Area. Have you ever tried Ukrainian food? It is both healthy and very tasty. I strongly recommend you taste local food while your Ukraine vacation. In case you are not going to visit this Eastern Europe country, you can discover more about Ukrainian food in Ukraine travel guide http://ukraine-vacation-guide.com/index/meals_in_ukraine/0-107 then look for online recipes and try to cook it at your home. Travelling Kosher can be hard. Especially when you are watching your fellow hotel guests eating delicious food! We had this problem when we went to Costa Rica. However, when we took our big road trip the next summer we got smarter. We took a ton of kosher biltong from a company called http://www.JoburgKosher.com and that saved us. Its kinda of like beef jerky, but much healthier. Its the only portable kosher food I can think of that is both satisfying, tasty and good for you. Hmmmm, I don’t know if you can get that through airport security / customs or not. I’d recommend to go to Panama for vacation. It’s very similar to Puerto Rico, but has many advantages. We used to live in Chicago and about 3 years ago moved to Panama. A short while ago I created a website http://www.kosherpanamavacation.com to promote Jewish tourism to Panama. The idea came along after I realized that, unfortunately, not many people in the U.S. and Canada realize that Panama can be a perfect spot for a great kosher vacation. Panama is a great place to visit from tourism prospective: close to the U.S., direct flights from most large cities, year around warm weather, two oceans, mountains, etc., etc. But besides all of that, that Panama has a thriving Jewish community with infrastructure that makes visiting it so much more comfortable for observant tourists. There are five synagogues in the Jewish neighborhood of the Panama City (four of them within 10-15 minute walk of each other, as well as from several 5-star hotels), and three more in the beach communities (approximately one hour drive from the city). There are two large kosher supermarkets, and over thirty kosher establishments. Welcome!